To my surprise, Denmark’s ranking is 273 and is actually tied with Switzerland! And the U.S. ranks 247, “only” 26 points behind! Seeing that that range goes down to 100 with the central African nation of Burundi being ranked last, I suppose I shouldn’t feel so bad about being an American. One thing I want to point out in this program is that it actually addresses the issue I blogged about before in “The Cold Danish Shoulder,” that was coincidentally mentioned on the TIME magazine blog entitled, “Should Danes lower taxes or just say ‘hello’ more often?.” The issue of Danes not having a trait of overt friendliness is mentioned and a Dane admits that natives rarely show their happiness and says, “they don’t talk very much” (out in the streets). 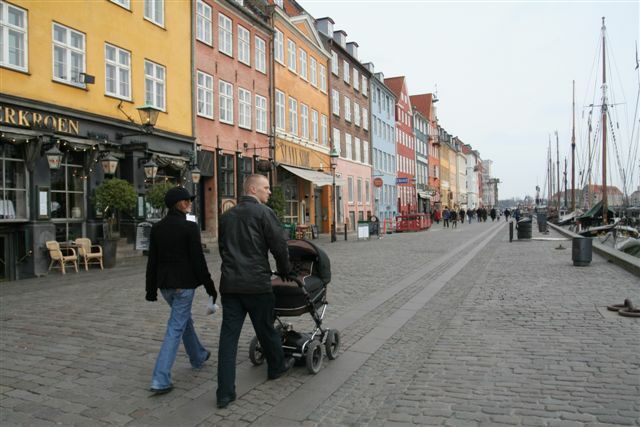 In addition, the program mentions another study conducted to determine the exact reason for the Dane’s happiness entitled, “Why Danes are smug: comparative study of life satisfaction in the European Union,” in 2006 that tested many hypotheses to determine the reason why Denmark was ranked so high on the happiness scale including genes, food, climate, native tongue, alcohol and smoking, marriage and children, general health, welfare state, exercise, prowess in sports and expectations. So, now there is some light shed on this mystery. It is a Danes’ right not to be talked to and Dane’s have more realistic expectations. It’s very cut and dry. Almost as black as their sense of humor, which I love by the way. They don’t have the need to talk to you and in return, they don’t expect anyone to talk to them. It’s not a bubbly, happy-go-lucky type of attitude but rather a low-key, no nonsense existence with a happy heart singing silently. Who knew? I feel so much better now! Next time I won’t take it so personally. Well, having just seen it, and being a dane, it was certainly an interesting show. It should be noted though, that when he said “danes dont talk in the streets much”, he did mean to strangers… having been in Manhatten, I wouldn’t say I felt people talked more to random people there, than we do in Copenhagen. Who knows, it was a short trip though. One thing your forgetting, is the general lack of stress. As the show mentions, paid school, paid healthcare, 6 week vacation, short working hours… all this adds to a fairly stress-free enviroment, and certainly if you couple that with low expectations, that will produce some happy people. Oh yeah, those happiness studies. I don’t think I’ve ever blogged about how annoying I find them, and how annoyed I get when American relatives stumble across them and mention them to me, given how much I dislike living here! I wish I could find the blog link from a Romanian fellow living and studying in Arhus who figured the results are because Danish people simply have very low standards. I mean, how could anyone be happy with the food here, he wondered? I agree, of course. I don’t think Danish people have as many things to worry about as other nationalities. The social system works for them, and one rarely has to choose between personal bankruptcy or caring for a sick relative, for instance, or staying in a bad marriage because of the costs of raising a child, all of which happens every day to friends and relatives in the US and other countries. Having basic needs like free healthcare, childcare stipends, free education and a healthy safety net create much more self confident people. It’s a huge weight not to ever have to carry around, I think, and frankly, I don’t think the average Danish person even realizes how much these things can shape ones psyche. “To be happy and to spend time with my family”. You see, when being happy is part of your measure of success and your own responsability, what will you answer on a survey that asks you if you are happy?? And later on he added that he thought the danes were not happy, were content, which I believe does not carry a lot of meaning in english, but it does in the latin languages (which he probably speaks). In portuguese, for instance, happy means both “feliz” and “contente”. “Contente” means to be satisfied, “feliz” means to be thrilled in total happiness and it is only used on the last line of a fairy tale book, the “happy ever after”. Problem is that in the latin speaking countries, the study asks if you are “feliz”. That is why they are the “most unhappy people in Europe” (which is totally not true). Funny. My Danish mother in law is happiest when she’s struggling to do a million things at once, burdened with the inability to say no. Just in response to Rodinsky’s comment.